Fell in love with a bunch of bricks last fall. While scouting materials for a friend's landscape project, a pallet of completely magnificent antique bricks appeared at the building yard and begged to be taken home. Found space in the backyard: simply had to. Two brilliant students of architecture set them out in unique pattern, and we created a sweet little launch pad for small summer soirees. It's the perfect place for a single cup of tea, accompanied by a good book, on a spring afternoon. A cozy cup of coffee, while wrapped in a warm coat, on a winter morn. 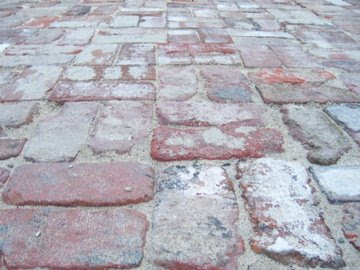 We are smitten with our new old bricks. Isn't it marvelous to bring into one's life treasures from the past, rescued by someone who carefully saved them? I thank goodness these were salvaged from their first home. They have found a new one. Oh, V. you HAVE to tell me more about this. It's exactly what I want to do in my backyard. How did they prepare the space? It looks like they took out the top layer of grass, maybe? Did they put sand down? Please tell me all about it. mamacita--charmed that you like it! They did a marvelous job. Did take away the dear old grass, and dug (maybe six inches?) deep...there were many, many bags of sand (for such a small area!) and a loud machine that thudded said sand down (and drove sweet Sadie, our dog, completely bananas). 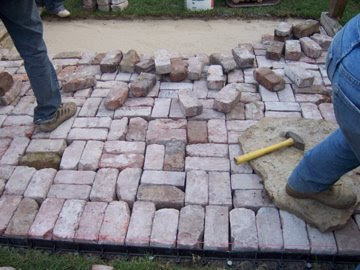 Bricks were laid out carefully--ever the art director, I had to rejigger certain colors in the end--and lots more sand was poured over all and swept carefully in. There's also a border, sunk all around, done at the beginning. Keeps the bricks happy and in place. I'm thrilled with it. Plan to post a few more shots in the spring, when flowers pop up. New/Old Brick is the only way to go...I was lucky enough to stumble upon hundreds of discarded old bricks (of perfection) form the demo-sight of a sidewalk in downtown Huntington, New York! One man’s garbage was truly another’s prize. Do not be put off by the cement that sometimes covers the bricks (especially those from sidewalks and fireplaces (only need a little tremor in California to knock a few chimney down, right)...a little tap of a rubber mallet does the trick. 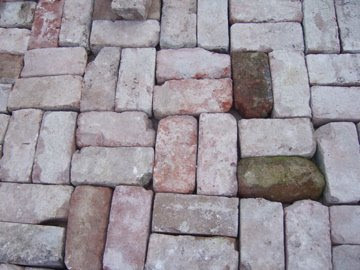 Even used driveway (Belgian Block) glue to puts some of the brick back to their original shape. No sign of glue after it dried. 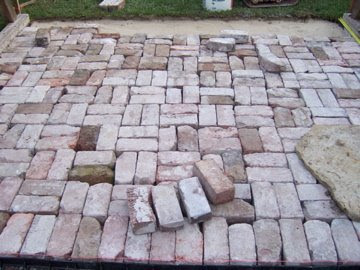 This is a project anyone can do (no offense to the talented students of architecture mentioned above) which is fun and forgiving...mess up the pattern you can just "kick out" a brick and replace. As mentioned before the frame and the base-sand are crucial…. To avoid weeds growing between bricks throw down some biodegradable salt-water-softer salt crystals and mist until dissolved. Works like a champ and won’t kill everything/anything you don’t want dead around the bricks. If you want something to grow between bricks then I suggest moss…the sand usually is enough to get it to grow. Feed the moss often as the sand doesn't hold the nutrients needed to keep the moss growing. You might have to replace the sand every 3 years or so (which fine play sand works great and is very inexpensive).